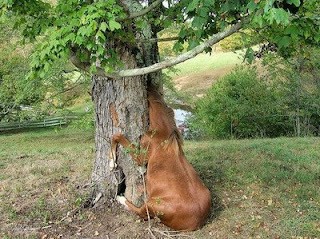 Oh dear!Do you suppose this horse wanted something sweet from the honey tree? Oh, oh, help and brother….I’m stuck! Poor Gracie, she found herself in a pickle. “Winnie the Pooh” books were written by A.A. Milne. They were my daughter Jenni’s favorite children’s book series. We all loved Edward Bear, known as Pooh to his friends! As a child, did you love Pooh? Did you day dream about life in the Hundred Acre Wood? As Pooh would say “Time for something sweet”.